The above thread already solved copying the UV set to another object and I had a chance to get back to this and now checking with other dbo models, there's a problem with getting the right material from the 2nd UV as opening the output model, it seems it is reading from the 1st UV but both UV channels materials are there. ah yes, I recall posting a code error on that thread. I am interested in this and will have a "revisit" and get some code together as I've done a lot of DBO/texture/multi material type of code and format conversion stuff which has been pretty challenging and very satisfying. I'll fire up DBPro and have a play with some code after work. I have also been working on converting the DBO format and found the going slow. I have noticed there are omission errors in the DBO specification document. I also have been doing a little bit of work a day so I don't burn out and can maintain progress. It's been slow going but I haven't run into any road blocks yet. I will first read all of the codes and dump the data into a text file (phase 1). Then I will convert that code to store the data in appropriate variables and arrays (phase 2). Then I will have the code repack the data into a byte for byte perfect DBO file (phase 3). Since I have already done this for the other format I am working with I will then begin code to convert the data from one format to the other (phase 4). Then do the reverse (phase 5). Then the easy part give it all a nice GUI (phase 6). I'm sure weighted verts and animations will be convoluted an nearly impossible to figure out. Especially if the angles are stored differently and some sort of university level calculus course is needed understand and implement the conversions. Maybe. Hey, nice to hear from you again BoTR that would be awesome, thanks. Any update on this btw? Actually I'm only concerned with static objects with multiple UVs/materials and it would also be interesting to check out your work if it supports it and then some. RustyKristy wrote: "Actually I'm only concerned with static objects with multiple UVs/materials and it would also be interesting to check out your work if it supports it and then some." What I am working on would cover that but I am still a long way from releasing anything viable as I am too distracted with other things to work at a fast pace. Also I am working purely from a file format perspective. That involves basically needing to be able to parse and repack objects completely. This seems like a "Phase 3" problem. I am getting confused by your grammar in the opening post. Can you in detail describe the information that needs to be copied from Object 1 to Object 2? If I get to Phase 3 then I will be able to open the file up, make changes, and save it again. For example I have already done this for another file format where the material is merely stored as a string. So opening the file, changing the string, and then re-saving would change the material. actually the above initial testing isn't the best test as the cloned object already has the same texture data as the source DBO object. So I will test the source DBO against a plain and untextured DBO and see if the code still works. I'm not sure 100% it will, but you never know. Still playing around with all this, as there are other issues with the code. After a bit more 'dabbling', for the Humvee example. It has 1 limb and 2 textures/materials. And the actual UV data is actually present in staging (or layers) 0 and 8, so not 0 and 1 as I would have thought. Now in X format , my DBO2X program grabs these UVs from the DBO data and in the materiallist , the 2 UV's are actually 0,0,0,0,0 etc and 1,1,1,1,1 and then the 2 materials/texturefilenames are embedded near the "texturefilename" part of the ascii file. I think I'll get the code right and tidied up and then post here as soon as possible. thanks also to the person (I can't recall) who created the Humvee model from the Desert Storm Pack. This is free on github FPSC open source. model pack 75 if I remember. Also note, that this DBO has 1 limb so the target limb will be 1 as there are NO verts/UV's in limb 0. Change to use 0 if no limbs in your DBO/model. I find it useful to use PERFORM CHECKLIST FOR OBJECT LIMBS and then loop through each limb and see if it has an FVF size / verts/ indices etc. There is also a 'TEXTURE LIMB' command which allows you to texture limbs individually if your using commands such as ADD LIMB/Link Limb etc. been a while since I played with those for my own tools, but they are useful. if file exist("Out.dbo")=1 then delete file "Out.dbo"
This is so awesome BOTR! I already tested your previous Humvee output and so far it looks good! I will give it a try asap. Big Thanks buddy! Quote: "I am getting confused by your grammar in the opening post. Can you in detail describe the information that needs to be copied from Object 1 to Object 2? If I get to Phase 3 then I will be able to open the file up, make changes, and save it again. For example I have already done this for another file format where the material is merely stored as a string. So opening the file, changing the string, and then re-saving would change the material." Yes, again basically I have a standard DBO model with a 2nd UV texture (ie. 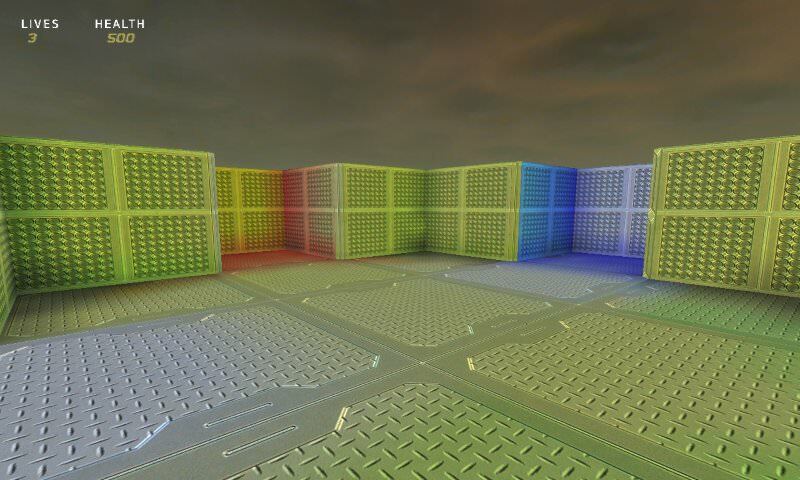 lightmap) and I want to have a separate model with the lightmapped texture only. That's all. unfortunately, there is not a lot of editor tools out there that fully supports the DBO format (except a few paid ones which is also not 100% working). There are some that I tried, but features are lacking like this one that I posted. @RustyKristy: no problem at at. I will have to test out using lightmap texture (FPSC DBO by any chance?). GameGuru supports DBO as it originally was written in DBPro and later got converted to C+. AppGameKit doesn't support DBO at the moment. my current version app DBO2X does convert to either X or OBJ that can be imported into AGK. It still needs more work to get it as close to perfect as possible as it also converts GameGuru's PBR / EBE DBO structures as Lee updated the DBO format for those when making updates to GameGuru. Nice! Yes, I was hoping that it will cover all DBO versions, particularly the ones with multiple UVs or at least UV2 for lightmapping like FPSC as you mentioned. I'm not sure with animations though as with my experience so far, I have not found any use case where it will be needed. So I already made the effort to create a basic FPSC map with lightmaps baked in for UV2 (see Attachment). I just got the assets from the Arteria Sci-Fi pack posted on the Github FPSC repo link. Here is the screencap.. The first two at top was produced with the said older code with some modification to output both diffuse and the objective and attempt to export the uv2 object (OutLM.dbo). I have provided a compiled exe as well for fast checking. As for the bottom left, this is a quick attempt to check the result by manually assigning it in fragmotion with the single lightmap texture and so it seems it does not copy or assign the material to the transferred UV, which I would think would be the case and as far as I know that technically this needs to be done by code as well. The bottom right would be the ideal result which I have assigned manually in fragmotion, matching the material number and group number, as simple as that it turns out. I'm not sure how to go about this with DBPro and it would be nice to just export two dbo outputs that can be merged with outside tools like Blender, since it is still a problem to import, open or convert a DBO file to a common/standard format. As for the above code that you posted recently, apparently I'm just seeing vertices when opening it with fragmotion with my earlier tests. Typo: The last bottom right result is actually a fragmotion UGH file and not in DBO format (ManualAssignMaterial.UGH, see zip file). @RustyKristy-ok, I see what you want now, thanks for the pics/zip. My segautowelder/autowelder imports/exports FPSC textured levels so you can import into GG or what ever loads in an X or DBO file. It unfortunately ignores lightmaps, but now I think about it, I could just get it to look at the lightmaps and ignore the .dds textures etc. So it might be I have the code already just needs some tweaking. So in theory it should texture/bake the lightmaps into the DBO FPSC level for each limb in Fragmotion but might be more to it than I realise. This should be possible to do, let's see what I can come up with. here is a code snippet from my Autowelder tool (the next SegAutoWelder incarnation), which has super fast FPSC level import/export feature (fully textured). This bit of code excludes the lightmap files. So I will update the code and do some reworking to get the program to reproduce the FPSC level but using the lightmaps. 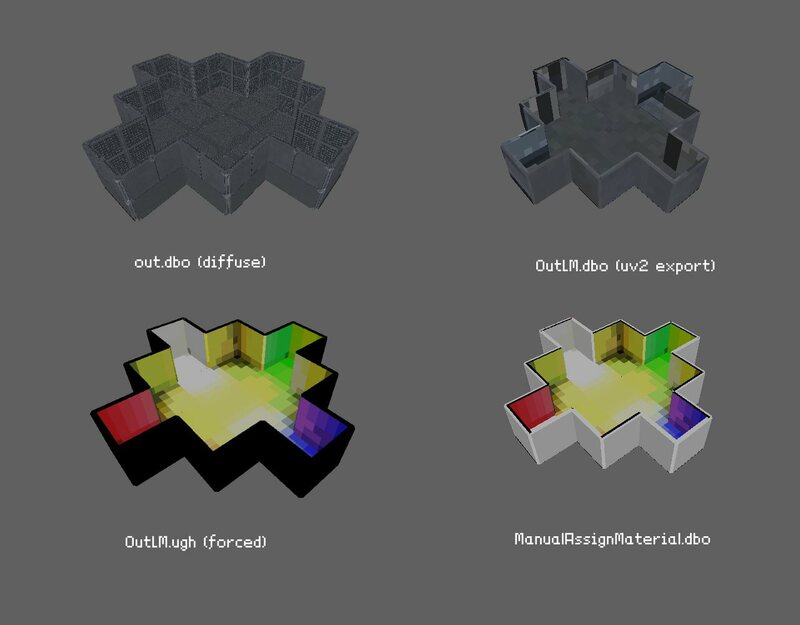 But I'm assuming from the above pic (bottom right) you still want to see the segment textures that were used? A lot of the code needs major improvments anyway with some new techniques I've picked up over the last few months or so. The level exporter also allows other options and re-centers the level a 0,0,0 if you want to or keep the original position. once I get some good results, I'll upload some pics. Looks good BoTR. Do you have any working updated code to post? So far I haven't got any code working since this thread got started. thanks. yes, I have the code , although it's split into 2 test programs, my AutoWelder app and other test app. Just a case of grabbing the right sections of code in Autowelder and adding it to the test code app + cleaning it up/optimising etc, then will post. You will have to modify the 0.dds or 0.png with a white background (or experiment with another colour) and save out as either DDS or PNG. Also, place the media files in the project folder. Here the code breaks up the FPSC level DBO into limb objects and then copies the UVs over. You could if you want save each limb out as a DBO or .X file for loading in later. What I usually do with FPSC Level DBO's is reposition the vertices so that the level sits at 0,0,0, but for demo purposes and to keep code short I've left it out. Experiment and have fun with the code. thanks BoTR, I tried the code as is and used my previous attachment and placed it in the app directory. I now got the attached screenshot result instead. I also provided a 0_white.png texture and copied over the wall_simple2tex.dds texture. Am I missing something here? From what it looks like, it is picking up a diffuse texture and still not finding and applying the lightmap 0.dds file. should be ok as is , I'm using the same code as above. for the 0_white.png, it should work if you made sure you only filled the background with white and not the foreground [edit-actually I just tried with foreground filled with white and still came out ok] . Of course you could try the testing against the original 0.png/0.dds files, but you'll have black exterior walls. I've attached my 0_white.png here for comparison with your one. Note: we are only loading in the lightmap image now and also converting the object fvf to 274. Opening the X files in notepad will show the new UV coordinates. A lot of my test code was very very long, dumping out text files showing old and new UV coords for each object/mesh. So I know the copyobjectUV function works correctly. Note2: You might want to consider creating a dummy object and attaching the meshes as limbs and then texturing the limbs. That way you can save out the whole level as 1 object file. Another piece of code I usually add (and might add later) is the collection of textures used for the whole source DBO. This list then gets sorted and any duplicates get removed from the list. Then with the addition of another bit of code that handles the limb texture assignment, you can load in and texture limbs using only the minimum of images over and over. Good resource optimization. print "Use arrow keys to move around:"
warningmessage "CleanUpTempFiles: No source folder selected!" warningmessage "CleanUpTempFiles: No file extensions selected!" warningmessage "Occurs: No source string selected!" warningmessage "Occurs: No search character selected!" I commented each line until I got it to compile..
Could not understand command at line 224. Could not determine parameter type of 'fast upper$(extract fileext$(file$))' at line 247. Could not determine parameter type of 'extract fileext$(file$)' at line 247. Subscript must be Integer or DWORD when referencing an array at line 249. Subscript must be Integer or DWORD when referencing an array at line 256. Could not determine parameter type of 'fast upper$(file$)' at line 257. Command out of place at line 259. Could not understand command at line 270. Could not understand command at line 275. Could not determine parameter type of 'fast len(src$)' at line 279.
ah yes, you need IanM's matrix1utils plugin, or remove the offending commands and replace with equivalent functions which are fairly easy to write. I've used the plugin just for speedy development. Thanks BoTR, was not feeling well within these past few days so just got back to this, will check this out. I have the MatrixUtils but not all are installed. If I can use it without those, the better. I hope the replacement function works. @RustyKristy: Hope your feeling better. Yes i've tested the replacement functions and work fine. I'll post 2 more final versions, 1 using M1utils and 1 without. Also, the final code loads in unique texture filename and texture's each limb according to it's assigned texture/image ID. If you want to work with other "universe.dbo" type files, copy the dbo over into the app folder. Copy the levelbank folder containing the lightmap textures over to the app folder. Comment out the line that converts the suffix to a .PNG format (only used for the example In.DBO). Also , if you want to delete any old temp files in your Appdata, Local, Temp area, then uncomment the CleanUpTempFiles(tmpfld,suff$,"dbpdata",7,"") line. Should import into Fragmotion without issue. updated code above, added the line "rawlist$(t).image=img" to prevent error occuring on deletion of images (clean up process). We only want to delete each unique image ID and I forgot to assign .image to img var within the rawlist$() array. Could not understand command at line 50.
willing to try the matrix utils, if you let me know the specific number or DLL name, there's a lot of them. array insert at bottom(rawlist$() )"
nope, otherwise it wouldn't work for me. I just copied and pasted the code from the non-MU1 version from above and compiled it without issue. I'm using DBProEX on Windows10. I'll test on the retail version, though it shouldn't make any difference. I'll check the code again to make sure there are no MU1 related commands. The MU1 version uses dll 29 and 16. I will also double check this. If you don't have Styx, just replace it with a temporary folder of your choice. it points to the the appdata\local\temp folder under users<username> depending on your OS. Actually another thought is that the non-MU1 isn't truly non-MU because the code needs get arrayptr and sortptr and other ptr related stuff. I recommend using the MU1 code , installing MU1 (16 and 29) and Styx if you have it or just do the above with tmpfld. I've removed the code from the above, it needs updating. so got a bit confused as I take most of the commands for granted these days and don't think much about which plugin they come from. Ok so for the extract fileext$ and extract filename$ etc, these are actually Styx commands and not M1U plugin commands. Anyway, I don't really feel like rewriting a complete sort array ptr like function and other MU1 functions as this would take too long and I don't have time, so I would definitely recommend just installing Matrix utils plugin. If you don't have it, I'll post it. If you don't have Styx plugin, I'll post it. Be careful with Matrix utils and styx the strings dll conflicts if I recall. hmmm interesting, I also tried to run the program using DBPro Online and get same error message you both got. Maybe that's why I now use the open source DBProEx. I might install the retail version 7.7 and see if I get same issue. Thanks Botr . I didn't even know I had styx installed in my laptop . it keeps the same error in line 50 array insert at bottom(rawlist$() ) . I have aswell matrixutils dll ...I have used long ago. Some time ago, I made a lightmapper with the help of Evoldved funcktion and it really works ok, but I can only save to dbo. I was trying to save to .x with my converter dbo2x but you can't keep the lightmapping unless we could somehow reder to texture like Blender do ...I was interested in this thread from begining to see if I could guess something with it. I have test your last update, and my laptop krash ...I had to unplug even the electricity because it was like dead . Like most grumpy grandpa , I don't like too much updates and I still use old Dbpro 1.074 but I don't think that could be my problem as I have tested it aswell with 1.77 and same result. Thankyou anyway for your effort .